The following is an interview with future IMPACT Director Shanda Poitra of the Turtle Mountain Reservation in North Dakota. 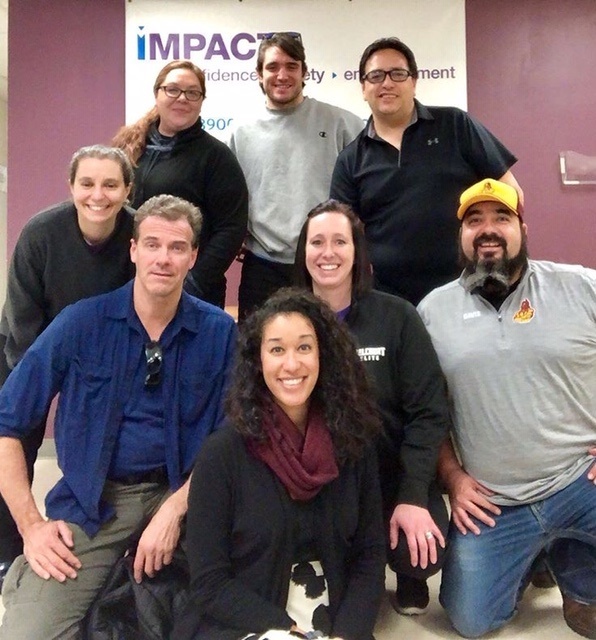 IMPACT Boston has partnered with Shanda and her team to train them as instructors and help them open an IMPACT chapter on the reservation. How did you get connected to IMPACT Boston? Where did the idea come from to start your own IMPACT chapter? I was born and raised on the Turtle Mountain Reservation. It wasn’t until I was 24-years-old with 3 children that I left my hometown for college and, unfortunately, I took my bad relationship with me. When I reflect back on those days, I feel like it wasn’t me, like I don’t even know the person I used to be and I can’t imagine how I lived through most of those days. I had 2 children in diapers and daycare, and 1 in elementary school, not to mention a full-time University class schedule. I wore many masks back then… and layers of clothing to cover the bruises. Despite the darkness I was living in, I was a great student; I knew that no matter what, I HAD to succeed; I knew there was more to my future than what I was living, so I kept working hard. Fall semester of 2010, I was searching for an elective and came upon an IMPACT self-defense class. It changed my life forever. I walked into class on a Friday thinking that I would learn how to handle an attacker with a weapon, and walked out that Sunday with a voice so powerful I could handle the most subtle boundary violations, along with physical attacks. I practiced what I learned from IMPACT every single day. IMPACT helped me heal from the violence I was experiencing at home, and also helped me develop the strength and skills to leave my abuser. This experience strengthened my commitment to making the healing I found in that IMPACT class available on the reservation. I began working with Kay Mendick of University of North Dakota, but when the University closed the IMPACT program, Kay became unable to train and support us. Instead she suggested that I attend Empowerment Self-Defense Global Camp, which I did in 2017, along with Sara Rae Davis, the other lead instructor candidate. We met Meg Stone of IMPACT Boston at ESD Global camp, but it was Sara who actually sat next to Meg at an ESD dinner; Sara shared how much we loved IMPACT and explained that IMPACT was exactly what we wanted to bring to our reservation. Since then we have worked together toward our ultimate goal of bringing IMPACT home to the reservation. Why is this something you feel your community needs? Why is this important to you? I moved back to the reservation in the fall of 2015 to work for our Indian Health Service and to be around family for the first time in over a decade. Within my first week of being home, I noticed so much violence that I once thought was normal behavior. One morning, I got a phone call notifying me that my childhood friend was beaten and left for dead by her children’s father; she was flown out to the nearest ICU and taken in for surgery for a hematoma in her skull. Having taken an IMPACT class and feeling that solidarity among a team of strong women, I knew something HAD to be done about this. What are some of the ways indigenous women are particularly vulnerable to violence? There hasn’t been a whole lot of discussion about the violence against women in Indian Country. I suppose it’s difficult for the leaders of this “free world” to really acknowledge Indigenous pain because that would bring up the cultural and historical legacy of the violence that was done to our people. The #MeToo Movement has moved mountains in how we view and discuss sexual abuse, however, many Indigenous women feel that the movement is often not inclusive or representative of our experiences. While our cries are being ignored, more and more of our women and children are being violated in countless ways. The Missing and Murdered Indigenous Women organization has just recently begun to collect data on missing persons, but the numbers are uncertain. In North Dakota, the development of horizontal drilling and hydraulic fracturing, or “fracking,” created more than 100,000 new, high-paying jobs since April 2009. Tens of thousands of people from all over the country—the vast majority of them men—have flocked to Williston and the neighboring oil-patch towns of Watford City, Minot, and Dickinson, among others, seeking work. In Williston alone, the population grew from a quaint little farm town of 15,000 to 60,000 in just 4 years! North Dakota now has the largest concentration of men in any state, except Alaska; men who have come from all over the country have formed their temporary housing developments into “man camps,” which have become a cesspool for crime, drugs, and violence, including prostitution and pedophilia. These men didn’t just stay in that part of North Dakota. With fluctuating schedules, they were able to travel throughout North Dakota, South Dakota, and Minnesota, bringing their money and desire for criminal activities with them. Human trafficking became a major issue, and the majority of women and girls involved were Indigenous. According to the 2016 National Institute of Justice Report, 56% of Native women have experienced sexual violence in their lifetime. The high rates of sexual violence are closely interconnected with the likelihood of Native women going missing or being murdered, and on some reservations, they are murdered at MORE THAN TEN TIMES THE NATIONAL AVERAGE. The numbers of Native women and girls missing and murdered in Canada are equivalent, if not higher than the United States, making this an International Crisis. What kind of positive changes are you hoping to see in Turtle Mountain culture? To put it in the simplest terms, IMPACT saved my life and I want my Native sisters to have that same opportunity. I was lucky that my University offered IMPACT, but not all who need this class are in college. I truly believe that with IMPACT, we can do our part in healing our sisters and changing societal norms. With IMPACT Boston supporting our mission to become an IMPACT Chapter for Indigenous women, we can change the narrative and reclaim Native truth. Our women need to be reminded of the strength that we already possess. What has the training process been like? What’s coming up next? When are you expecting to launch the IMPACT chapter? IMPACT Boston paid a visit to our reservation in June where we put on 7 workshops for women and girls. Then, in December and January, we attended a week-long training in Boston, learning how to teach a 3-hour workshop, which ended with two mock classes; both were very successful! The constant feedback we were given was constructive and honest. Training with IMPACT Boston feels equivalent to being a student; the atmosphere is safe and supportive, making it easier to drill the material over and over until we get it just right. I feel so relieved and grateful that IMPACT Boston agreed to work with us. The passion for this work is definitely electric on both sides; I know we’re in good hands. And I couldn’t have found a better group of Turtle Mountain instructors. They are truly the right people to deliver this sensitive, yet empowering service to our community. Put that together with IMPACT Boston and we’re definitely a force—a match so natural and genuine—we’re a family. As a Native American, I strongly believe that if you’re for our cause, you’re one of us!